The latest polls suggest a grass-roots strategy for passing Amendment 4, tax credits for solar and renewable energy, is working. One of the biggest problems with the Sunshine State is that it’s not --at least not when it comes to turning all that sunshine into electricity. Florida has the potential to be the third-largest solar generator, but it ranks 13th among the states. Amendment 4 is designed to fix that. Simply put, Amendment 4 would cut property and equipment taxes to encourage more businesses and homeowners to switch to solar power. The idea is such a no-brainer, Democrats and Republicans in the Florida Legislature had no problem putting it on the ballot. More than 200 business and environmental groups are behind Amendment 4, so supporters didn’t bother paying for an expensive TV campaign. The grass roots strategy is working, says St. Leo University pollster Frank Orlando. Amendment 4 does even better, 70 percent, in the latest Florida Chamber of Commerce poll. That’s comfortably above the 60 percent threshold for passing. But Moncreif isn’t popping the Champagne corks just yet. Lawmakers put Amendment 4 on the August 30 primary ballot to avoid confusion with another campaign, and Moncreif says that’s a problem. Florida is a closed primary state, but anyone can vote on the amendment. The “Yes on 4” website added a tool last week that helps people find their early voting sites. Moncreif says supporters hope it will fix the problem. Southern Alliance for Clean Energy’s Susan Glickman says Amendment 4 sells itself because it blends environmental protection with economic growth. But Amendment 4 supporters worry voters could get confused. The utilities are backing another solar initiative on the November ballot, one Amendment 4 backers oppose. 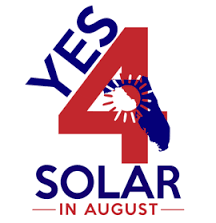 Amendment 1 guarantees the right to own solar equipment. Critics say it’s a Trojan horse that would sock solar users with higher utility rates. Glickman says Amendment 4 supporters are waiting before launching their Amendment 1 attack. Even a landslide victory won’t seal the fate of Amendment 4. Lawmakers will have until 2018 to work out the details of the tax cuts.